Kwadacha Wilderness Provincial Park in Northern British Columbia is host to numerous glaciers. Here we focus on an unnamed glacier that drains north into the Kechika River, which joins the Laird River. This glacier straddles both a watershed divide. 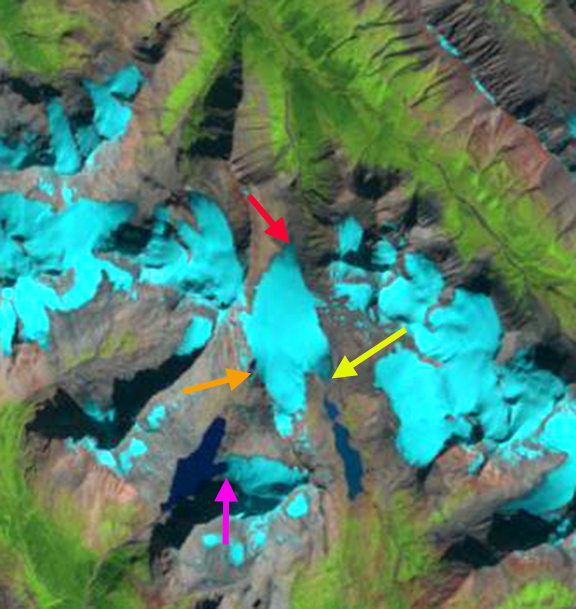 The map of the glacier indicates the three separate termini of this glacier. 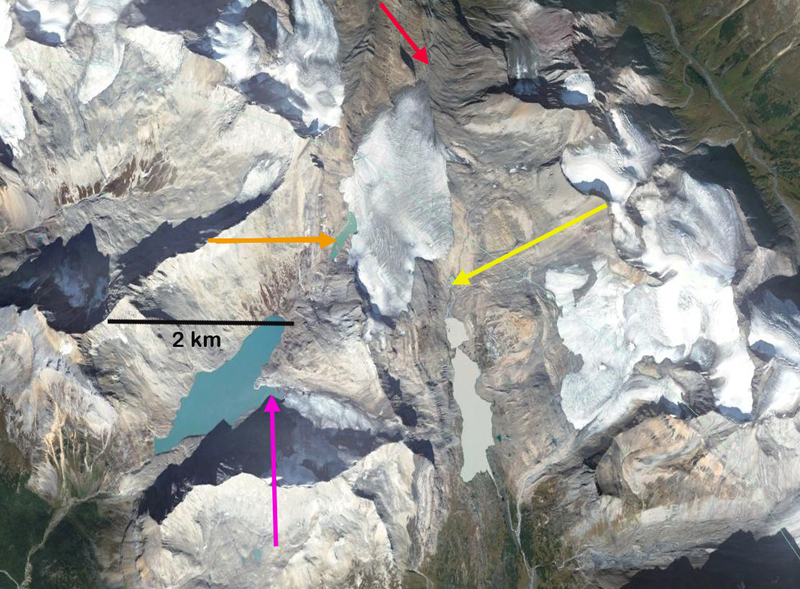 Bolch et al (2010) noted that this area of BC lost 15% of its glacier area from 1985 to 2005. 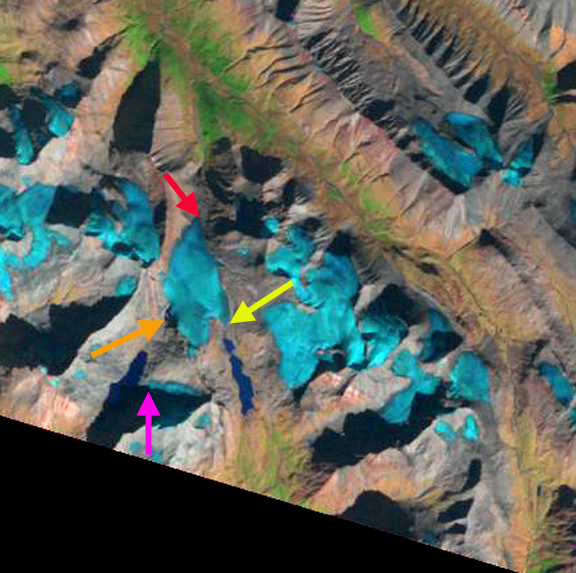 A comparison of Landsat imagery and Google Earth imagery during the 1994-2013 period indicate the changes to this Kwadacha Park glacier. In 1994 the glaciers three termini are at the red-northern terminus, yellow-southeaster terminus and orange-southwestern terminus arrows. 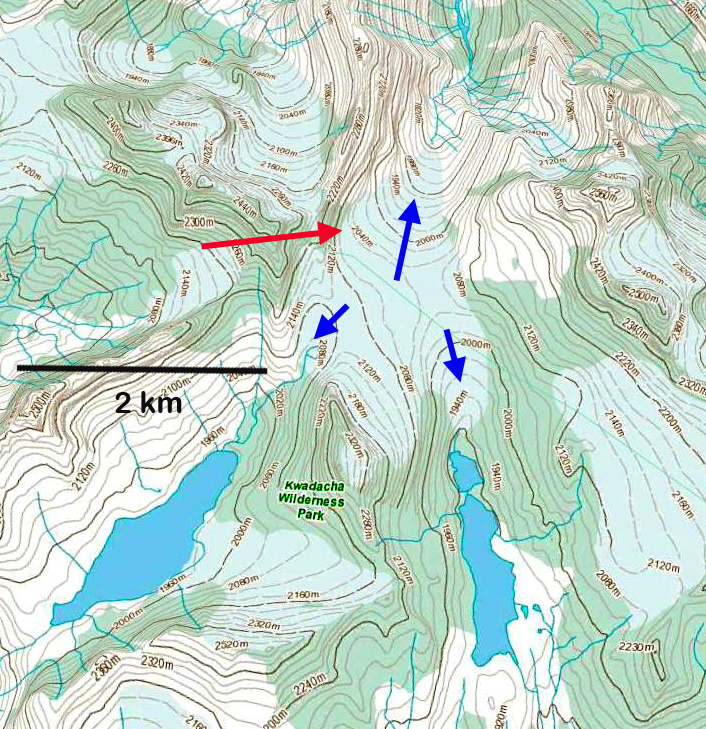 A separate glacier ends at the margin of an alpine lake at the violet arrow. In 1995 there is no snowcover retained on the glacier. In 2001 the terminus at the orange arrow has retreated leading to lake expansion and at the red arrow. 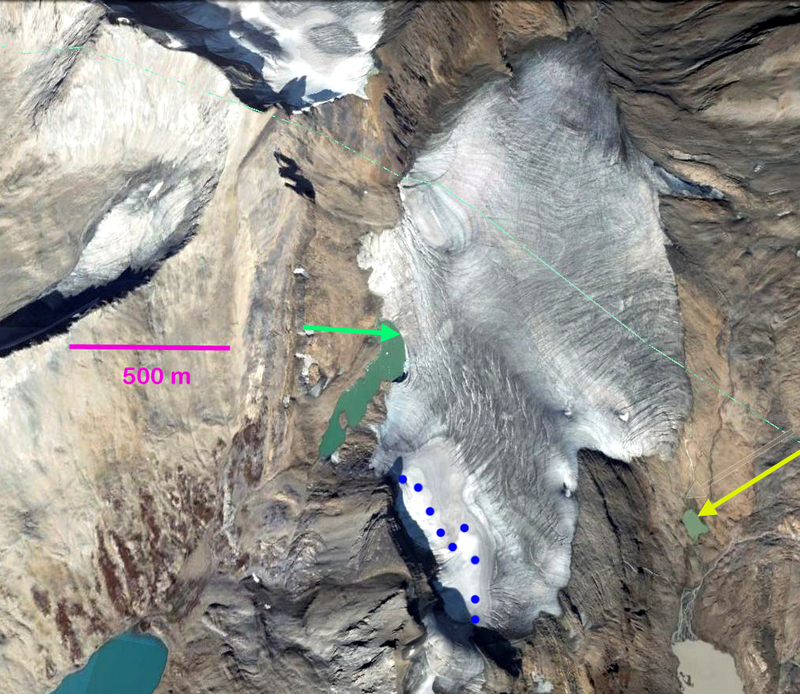 By 2013 the glacier’s northern terminus has retreated 250-300 m since 1994 and now terminates at the end of a rock rib. 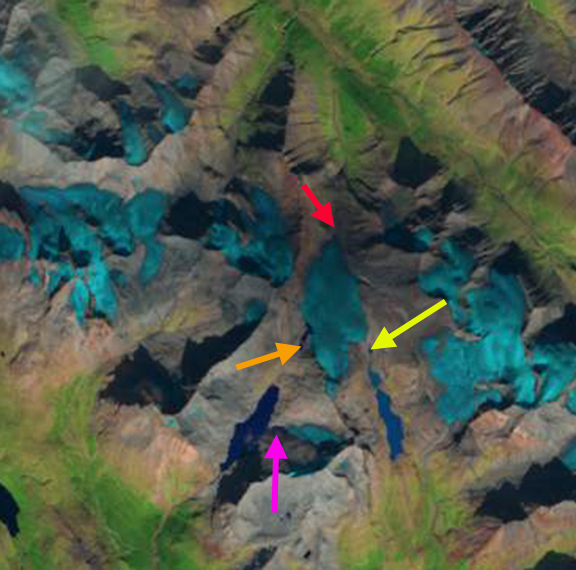 The southeastern terminus has retreated 250 m losing most of this glacier tongue. The southwestern terminus has retreated 300 m, and some calving is occurring. The glacier also has no retained snowpack in 2013. A glacier that consistently loses all of its snowpack cannot survive (Pelto, 2010). This glacier falls into that category. The retreat is evident in the Google earth image with the arrows marking the 1994 terminus locations. 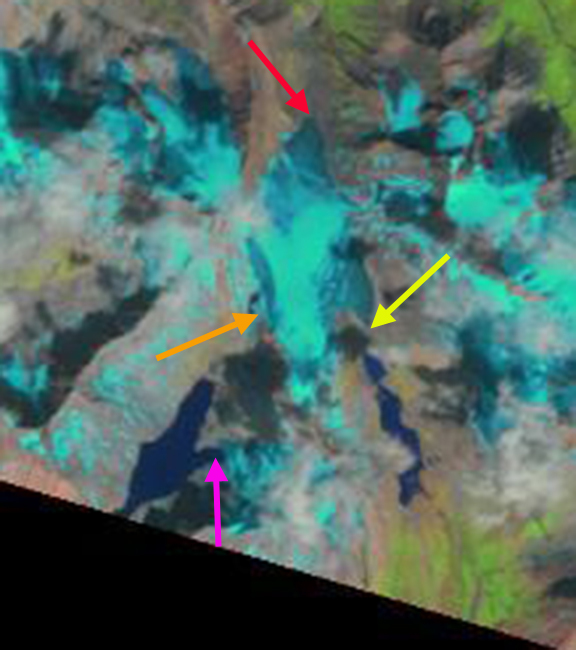 A closeup of this image indicates the lack of retained snowcover, blue dots mark snowline. The southwestern terminus calving margin is noted at the green arrow. The near stagnant nature of the northern terminus is also evident with the lack of crevassing. This glaciers will continue to thin and retreat and with current climate will not survive. The retreat is similar to that of other glaciers in the region including Snowshoe Glacier, Yukon, Great Glacier and Freshfield Glacier. This entry was posted in Glacier Observations and tagged british columbia glacier melt, British Columbia glacier retreat, Kwadacha glacier retreat, laird river glacier retreat, northern british columbia glacier retreat. Bookmark the permalink.